Baryonyx, meaning (heavy claw or 'nail) is a genus of carnivorous saurischian dinosaur first discovered in clay pits just south of Dorking, England, and later reported from fossils found in northern Spain and Portugal. It is known to contain only one species, Baryonyx walkeri. Its fossils have been recovered from formations dating from the early Cretaceous Period, around 130�125 million years ago. Baryonyx is one of the few known piscivorous (fish-eating) dinosaurs, with specialized adaptations like a long low snout with narrow jaws filled with finely serrated teeth and gaff-hook-like claws to help it hunt its main prey. An adult Baryonyx was about 8�9 feet tall, 31 feet long, and weighed in the region of 3,700�6,000 pounds. 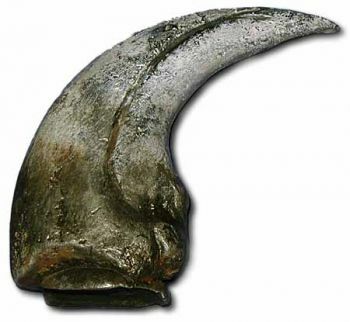 Baryonyx had a large claw on the thumb of each hand, which measured about 9.8 inches in a straight line from tip to base. Its long neck was not as strongly S-curved as in many other theropods. The skull was set at an acute angle, not the 90� angle common in similar dinosaurs. The long jaws were distinctly crocodilian and had 96 teeth, about twice as many as Tyrannosaurus. Sixty-four of the teeth were placed in the lower jaw (mandible), and 32 large ones in the upper (maxilla). The teeth had slight keels on their leading and posterior sides, with fine serrations (7 per 1 millimeter). There was a knob-like protuberance on the nasal bones. The upper jaw had a sharp angle near the snout, a feature seen in crocodiles that helps to prevent prey from escaping.